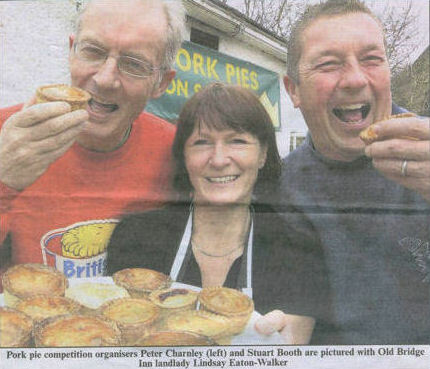 Pork pie lovers had a treat on Saturday as the annual pork pie maker competition got under way. Hundreds of people turned up to The Old Bridge Inn in Ripponden to sample the delights of some of the countrys best pork pies. This year there were 53 entrants from butchers and bakers from as far afield as Glas­gow, Keswick, Southampton, and of course, from all over Yorkshire. Pie and peas were served throughout the day. There was also a performance from Elland Silver Youth Band. But of course the main attrac­tion of the day was the hundreds of pork pies freshly baked from some of the countrys best pork pie makers.